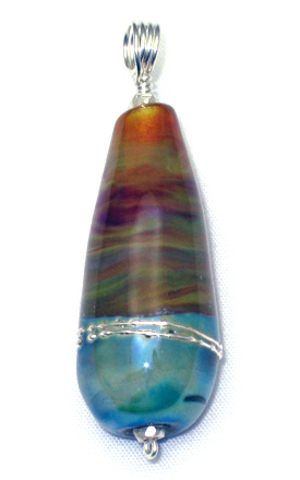 This round, teardrop shaped pendant bead is a combination of two high silver content glasses on a base of opal yellow. The interaction of these glasses along with varying the torch settings as the final step of finishing the bead produced the subtle patterning and blue/green sheen on the lower portion of the bead. As a final step, pure silver wire was wrapped around the bead and gently melted into the glass.